Obviously I am not feeling much workplace satisfaction at the moment. Moods are low at VA. Public opinion of the Department of Veterans affairs is historically poor and getting worse. I lament the absence of breaking news stories about how hard we work for very little gratitude, and how frequently we are the force behind changing veterans’ lives for the better. Granting a few exceptions, we are a remarkable group of dedicated and diligent workers (many of us veterans ourselves), daily negotiating the morass of bureaucracy in order to do our jobs. (Did you ever grumble about the laws and paperwork it took to unravel a tax problem, or get a Fannie Mae loan, or file for Social Security disability? Imagine if your job was to work within that system every day.) Recently we were ordered to mandatory overtime for the third summer in a row. Some time ago at work we were talking about prisons (voices bouncing across the tops of the cube walls low enough that foreheads remain visible), and books on prisons. I mentioned Foucault and how it struck me that our Cubicle Sea (as I fondly call it) is a form of Panopticon. In his famous book Discipline and Punish, Foucault examines Jeremy Bentham’s concept of the Panopticon, a radical prison design. You can read an excellent summary of the design, and its intent, at J.N. Nielsen’s intriguing post. Very briefly, the Panopticon as a prison is where the cells are arranged in a circle around a central tower. The cells are backlit and open to the center, so that anyone in the tower can instantly ascertain what an inmate is up to. The tower is shuttered, so the prisoners can’t tell what the officers are up to, or whether there is anyone in the tower at all. They are motivated to behave at all times, since theoretically they could be watched at all times. The aspect I am taken with is the pure application of power, disguised as something else. It’s a smart use of space, it’s good for reform, and it reduces the burden of the officers. But really, it’s just an effective application of power. The Panopticon states to its inmates: you are inferior to us and we have the right to observe and judge you in every aspect of your time here. Dehumanizing and brilliant strategy for hegemonic control. Consider if you will, the office environment of Yours Truly. My floor takes up an entire block, with windows nearly floor to ceiling around the perimeter. The center of the floor is where the building elevators are located, and around the elevators are arranged the supervisors’ offices, with large windows and shutters and doors. Cubicles fill all the space between the center offices and the perimeter windows, and they are set back from the windows when possible in the office design, to prevent any blocking of the light. The height of the cube walls is just below chest-height when you stand, and does not obscure your head when you sit. We are all in view, therefore, of each other, and of our supervisors in their offices. The more I think about it, the more I am convinced that our cubicles are a modern-day Panopticon, an unsettling mimic of Bentham’s idealized prison scenario. No wonder we’re inexplicably miserable: aside from the other frustrations, we spend our entire work day in a physical environment that someone once believed would be ultimately demoralizing and punitive for inmates. It is a canceling of our individuality, decrying the idea that we are valued (or trusted) contributors. I searched the Internet to see if anyone else had come to this conclusion, and found that my idea is not original. Cynthia M. Daffron thought the same thing. 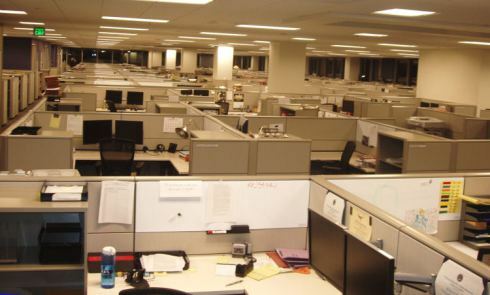 When recently the topic of cubicles came up in a Marketplace story, on American Public Media, I listened hopefully for some expert’s exposure of the failure of cubicles. Instead, in a cost-saving measure advertised as a hip new way to encourage co-worker collaboration, many companies are ditching the whole idea of cubicles to simply fill a huge open space with a bunch of desks and put us all side by side. I’m assuming the supervisor still gets an office with windows. If my employer were to ever take this step, I might suggest the supervisor’s office be placed in the center. A parting quote. You may also be interested in the thoughtful blog post from which I snagged the image. I find the panopticon concept fascinating. Glad you liked the post. This opens up so many thoughts I hardly know if I am capable of corralling them at the moment. To subject so many intelligent caring people to such a workplace environment is beyond rational. I have always maintained that a satisfied and happy workforce will produce satisfied and happy product/customer service. Granted some customers will never be anything but disgruntle. If an employee is disgruntle due to working conditions how can that NOT trickle down to the people they are trying to serve? Good luck cousin. I could not imagine trying to maintain a positive and healthy attitude in such a place as that. Thanks for the love, Cuz. I really did not write this from as black a perspective as it sounds. I’ve had a couple of comments from people now, and I realize that this post came across harshly, when I half meant it as a joke: No WONDER we’re disgruntled, we work in a prison! ha ha. Also, we can’t blame the government for the work space. It is a gorgeous brand new building that happened to be empty when the downtown federal building was being renovated. VA now rents floors 2, 3, and 4 of the PECI building. But I can’t avoid the fascinating parallels. Fascinating theory and so disturbing if that was a purpose to the design of your office. I feel for you having to work in an environment that makes one feel so vulnerable. Work is tough enough with out that!! !